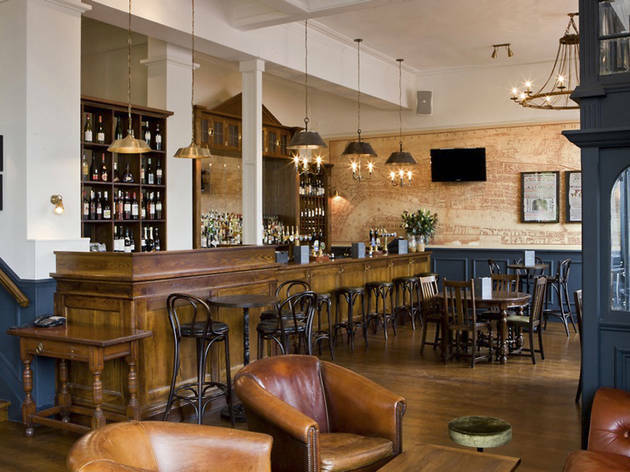 The Rosendale is the only food-focused pub to serve West Dulwich; perhaps it’s the lack of competition that has caused standards to slip despite this handsome establishment’s refurbishment by the well-regarded Renaissance group. The sheer expanse of the dining area, while an appealing place to sit (bright by day, cosy yet elegant in the evening), is clearly challenging to fill with diners. On our last visit, we noted punters migrating from the bar area to share a bottle of wine and maybe a bar snack. Arriving at a quiet time, we nonetheless faced a considerable wait for our food. When the meal arrived, even the promising ‘specials’ had the air of weary, part pre-cooked standbys: stodgy risotto; ‘pan-fried’ duck with grey flesh and soggy, resilient skin; old-school cabbage. The ‘summer fruit’ tart owed its crisp, buttery pastry to last-minute assembly that threw up unhalved grapes and unripe mango. Wondering at the pub’s popularity, we noted relaxed family groups populating the extensive, decked back garden with its dedicated toddlers’ play area. Add fairly priced wines and decent cask beers to the mix and the Rosendale continues to fulfil a welcome, if not gastronomically exalted, function. I really enjoyed my visit to The Rosendale for so many reasons. Formerly a Victorian coach Inn, the Rosendale shows off its proud history in its decor. Vintage Victorian posters plaster the wall along a handsome bar and elegant dining area. If you’re looking for the perfect beer garden, you’re in luck. The beer garden at The Rosendale is enormous. Not content with just an already pretty front outdoor terrace, there is also a side garden, a back garden with a children’s play area. Add to that full table service outside and you have the perfect beer garden. For a pub, you’d expect classic pub grub favourites: hearty and comforting. The Rosendale is a bit different and you can be forgiven for thinking it was fine dining! Resist the tempting sirloin steak and order the Sea Bream instead. Pan fried to perfection and smothered in delicious mussel sauce you’ll want to mop up every last drop. The food portions are very generous indeed, so resist ordering too much when on an empty stomach! Keep an eye on the ‘specials’ menu board which changes daily so there’s always something new on the menu. The staff swear that the pies at The Rosendale are the best thing since sliced bread. 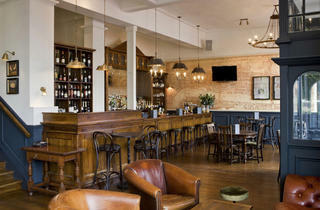 As it’s quite of the way, it’s normally the locals and family residing in Dulwich who frequent this classy gastropub. As a result, there’s a sense of community where you have a feeling people inside know each other and the staff that works at The Rosendale. Staff are very welcoming and great to have a chat with too. A genuinely top family gastropub with a huge garden, top service and ace food, it’s not hard to see why The Rosendale is a real family favourite gastropub. if you live in leafy Dulwich, then consider yourselves very lucky indeed. This was my local for a few years and I owe them several quality backdated reviews! The food is great, I would say a step-up from the average pub-grub. A friend booked out the top floor for his 30th birthday and it was a fantastic space for a ceilidh. The staff were awesome! It's Dulwich prices, but don't let that put you off. Good job Rosie! Popped in for a spot of lunch as it's local and accepts the tastecard so perfect! I love the décor, there is good space both inside and out which is helpful as it can get quite busy. There is a range of customers but seems to be most popular with the older generation and parents with children in buggies. The staff were very friendly and the food delicious! I ordered the rosendale burger which was really chunky although they didn't ask how I wanted it to be cooked and luckily it was just how I liked - medium/rare. Would definitely return! Kids are entertained whilst we eat great food...'nuff said. Excellent range of beers and impressive wine list. Roomy sun-filled (sometimes blindingly so) dining room and bar, lovely garden with soft-play and landscaped wraparound outside eating area. Really jolly bar staff, mainly well-spoken gap-yearers from the best schools money can buy. Extremely busy at weekends especially with parents and rugrats because the Sunday lunches are so good the local well-heeled families have given up using their Agas and have taken-up roosting here. At times staff can't cope with outdoor orders, which is a shame as the pub is struggling with it's own success. Recommend booking. Great space and wonderful roasts. I love my local! Very family friendly. Whilst the bar area is much better after last year's refurb (usually a couple of decent ales on, and a good selection of wine), the Rosendale is really disappointing when it comes to food. Pretty poor quality, overpriced stuff. A real shame. I think this is a great pub. I love the refurb. I had Sunday lunch there two weeks ago and the food was great. Roast dinner with all the trimmings and delicious banoffee pie for dessert. Wine selection is really good as well. Service was good and staff very friendly. So glad to have a great pub in my road now!